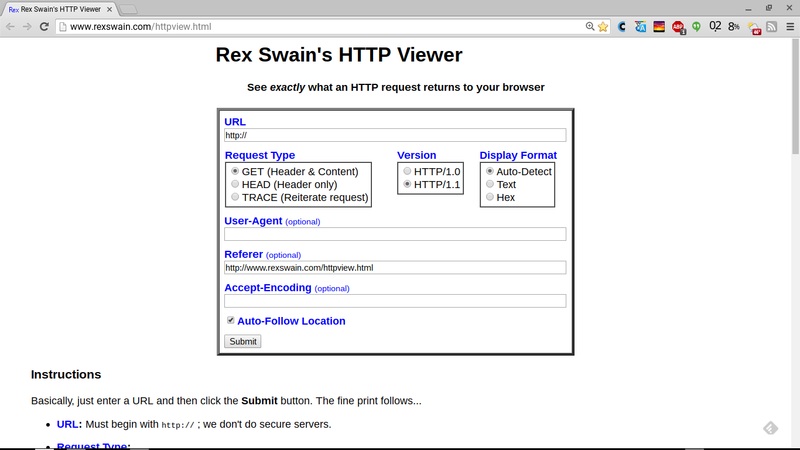 And when the link is clicked, the necessary HTTP trace is displayed. There is no need to provide instructions how to actually enter the necessary values, on the HTTP Viewer home page, to generate the necessary display. 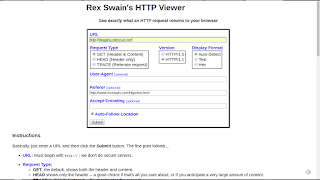 I use the Rex Swain HTTP Viewer, for diagnosing and documenting custom domain, malware, spam classification, and other connectivity issues. 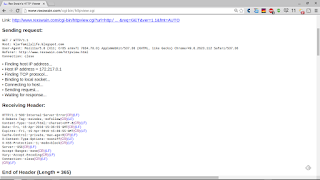 Start by verifying URLs involved. 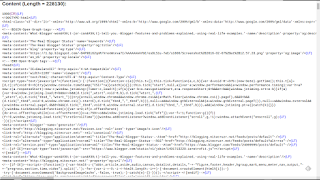 Whenever possible, make a screen print, and a text copy, of the Blogger dashboard Publishing wizard, at Settings - Basic. 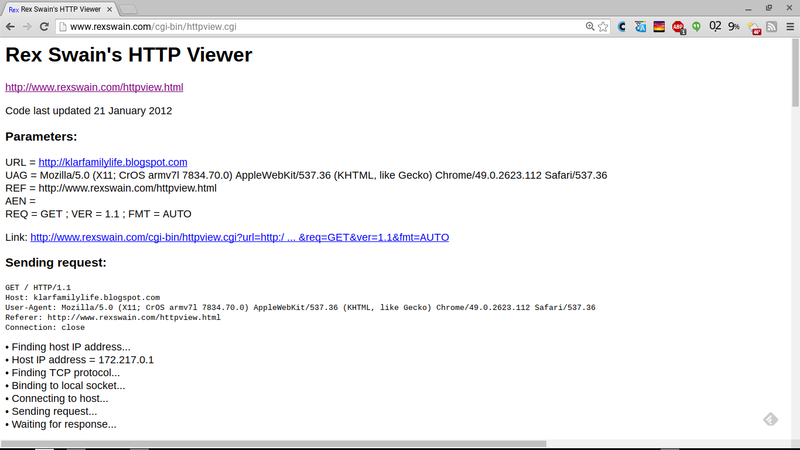 Here's a live example, of HTTP Viewer use. 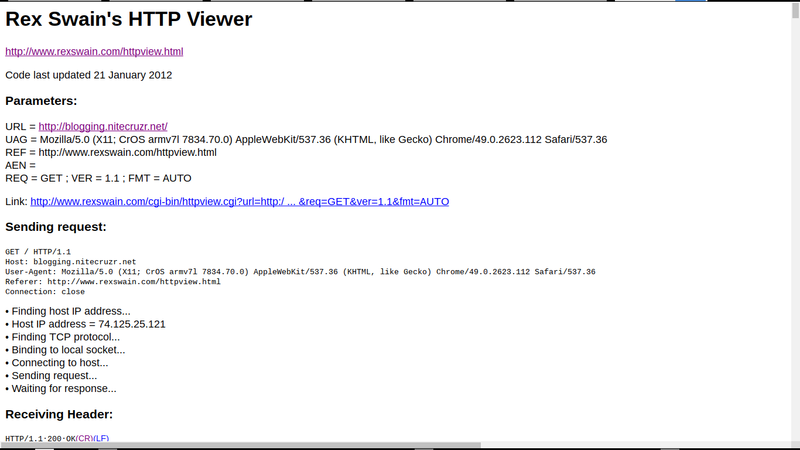 Note, HTTP Viewer only works in HTTP mode. 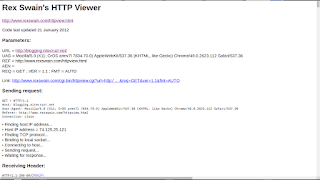 SSL is not supported. 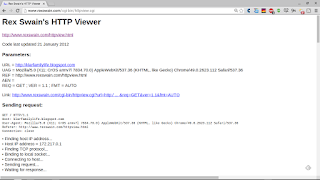 Fortunately, right now, the automatic "http:" to "https:" Blogger redirect, which is not optional, does not affect HTTP Viewer. Add the URL of the blog, and click on "Submit". This generates a lot of text. I'm not going to explain all of it, in this post. 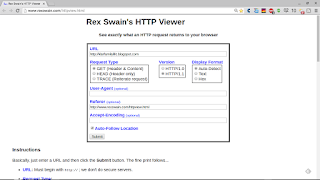 Since Blogger blogs have no post limit, I'll have more posts, later, that will involve HTTP Viewer displays. But here's the second page, of the above display. And here is the typical excerpt, that I will make, and display. This is an example of a notorious "500 Internal Server Error" - which right now is plaguing various blog owners who have corrupt templates. 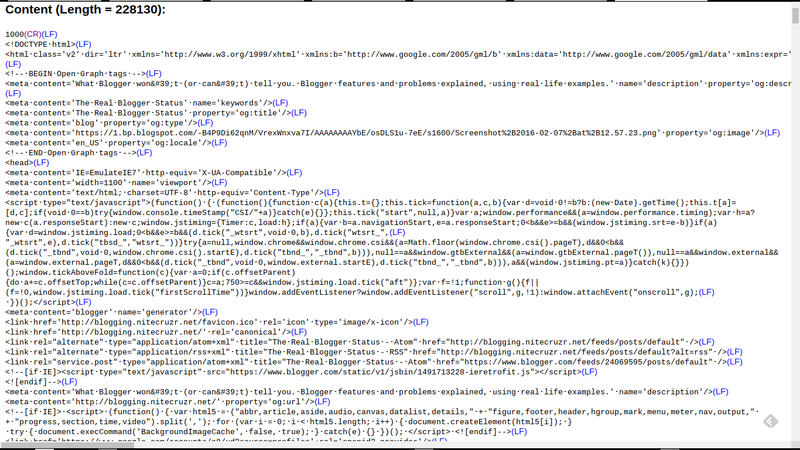 This is what we see with many blogs, when people report various bX codes, when using several Blogger dashboard pages. Template - "Customize" (aka "Blogger Template Designer"). Template - "Edit HTML" (aka "Blogger Template Editor"). Here's a second live example. 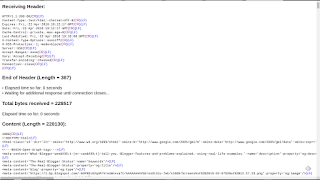 Here, we have an HTTP trace from this blog, http://blogging.nitecruzr.net/. 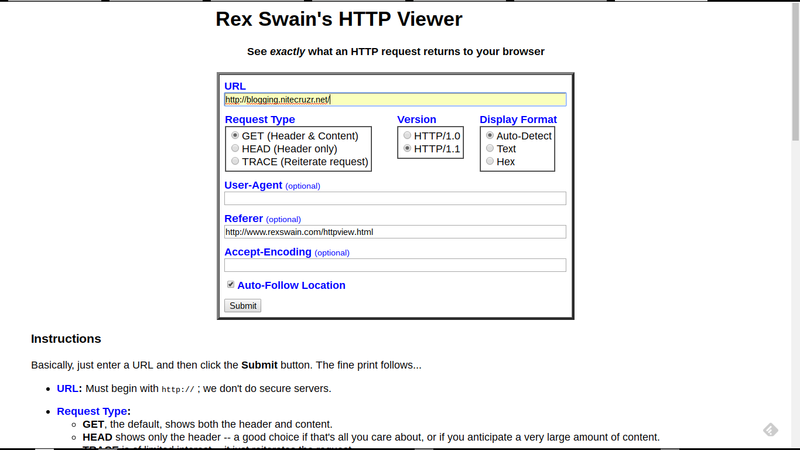 And, my typical display - which you might see, as an "HTTP trace excerpt", in a custom domain connectivity diagnosis. The latter connectivity diagnosis might be a part of my 12 link affinity / differential connectivity test. My trace excerpts include details which I, personally, decided are most useful for me. You may find additional - or less - details to be useful, for you. 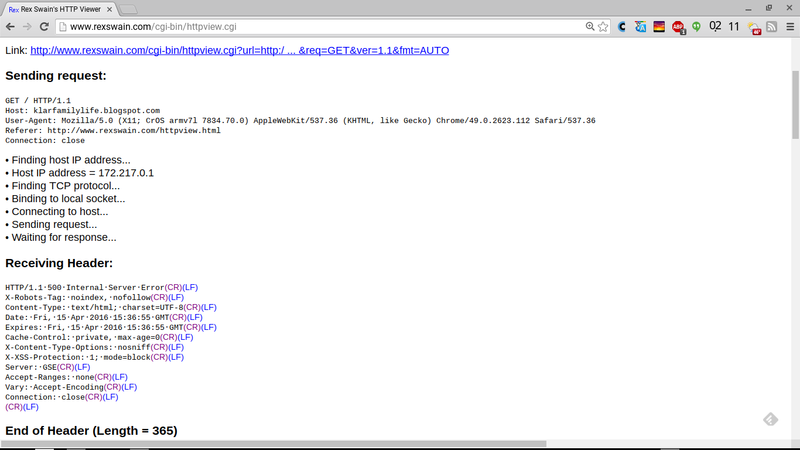 Here, we see just two examples, of my HTTP traces. There are an infinity of possibilities. 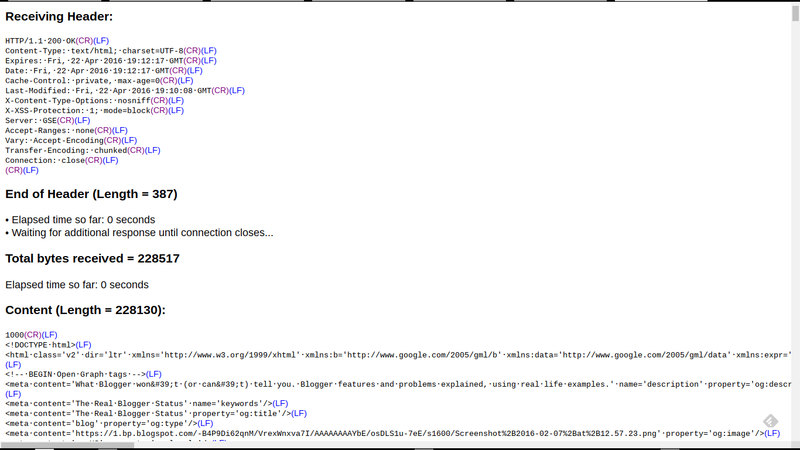 An online HTTP trace is a useful diagnostic tool, when diagnosing and identifying many different #Blogger problems. 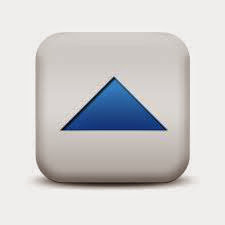 Custom domain, malware, spam classification, and other connectivity issues may be diagnosed and documented.